In California gold and other minerals were discovered during the 19th century and oil around the turn of the century. But it really got onto the map when Los Angeles became the centre of the film industry, due to its all year round temperate climate and long hours of sunshine, essential to the film industry at a time when virtually all film, regardless of interior or exterior scenes was shot on outdoor stages. This industry in particular created a new social layer of super-rich Californians, from movie stars to studio moguls with fathomless wallets and insatiable appetites for amusement of every sort. The entertainment industry was quick to see this opportunity and before long there was an exodus of musicians from the mid-west and the East keen to stake their claim. So by the early 1920s there was new music, technology, an audience and also money to be invested. It seems like all conditions were fulfilled for a California-based gramophone record industry, twenty-odd years after it development and establishment on the East Coast. Indeed a whole range of small companies appeared which primarily recorded local talent. The Nordskog label of Santa Monica became legendary for recording Kid Orys band but stayed a small label, like Golden, Hollywood, Silver Screen and Sunshine. A little more successful were Sunset, a store-label, and New Flexo, an unbreakable record. None of these start-ups however, had sufficiently worked on the problems of distribution; sometimes their records even sold only in one location. Their recordings were hardly distributed outside California and and consequently they are nowadays rare. Back East, the established record companies with national and international distribution were mindful of the entertainment boom on the West Coast and were keen to have a slice of the action. However all their equipment and facilities were on the East coast, so decisions had to be made. Victor, the giant of the business went the whole hog and set up a pressing plant in Oakland in 1924, Columbia, in perpetual financial difficulties did nothing until later in the decade, when its English subsidiary bought them out, whilst the new kid on the block, Brunswick, sent out its recording team to make the records in situ and ship back the masters for pressing. Theres an old tradition that all sorts of entertainment will settle in great seaports. The biggest ports on the West Coast are Los Angeles and San Francisco, California, and Seattle, further to the North, in Washington state. San Francisco, the oldest-established of the three had a long history of entertainment of the wilder varieties - a valuable source of information on San Francisco's contribution to jazz history is Tom Stoddard's 'Jazz on the Barbary Coast.' Musicians arrived in large numbers, including several major jazz pioneers from New Orleans. King Oliver's band was in California in 1921, whilst Kid Ory and possibly Jelly Roll Morton made their first recordings there - all of this before their glory days in Chicago. Also, several well-known and highly influential white musicians were active on the West Coast in the very early years. Drummer Art Hickman organised the first dance band with a saxophone section the mid-teens and Paul Whiteman followed in his trail. Around 1921 trombone player Miff Mole played there in Abe Lymans band alongside trumpeter Roy Fox and New Orleans cornetist Ray Lopez. In line with the growing economy, great luxury hotels appeared. In those years such hotels had a house band. "Hotel-bands" gave work to many musicians, providing they had significant musical training and experience. The top hotels demanded quality in their bands and were happy to pay for it. It is therefore no surprise that Brunswick decided to record the best-known hotel bands when they arrived as the first major record company to record on the West Coast. 11228/233 Seattle, Vic Meyers Hotel Butler Orchestra. It was thought for a long time that Vic Meyers band was from California, but actually the Butler hotel was in Seattle. With world-wide help from a number of collectors we are now able to fill in most of his story. Victor Aloysius Meyers was born in mid -1898 as the 15th of 16 children in Little Falls, Minnesota. Vic's father was County Treasurer for Morris County, Minnesota, a position he held for 30 years. When the family moved West to Oregon in the mid-'teens, Vic started on a musical career. He could play violin, but by the age of 18, he was a drummer in a three piece group that played each summer at Seaside, an ocean resort. At 21, in 1919 he got a two year contract to play with a full size band in the Rose Room in Seattles Hotel Butler, located at the corner of 2nd Avenue and James Street. Its construction started around 1900 and when it opened it "immediately became the jewel in the Citys crown. Its lavish Rose Room grill featured magnificent cuisine in an atmosphere of top recording orchestras, cut-glass chandeliers, thick imported carpets and sterling silver." This was written by Seattles historian Don Duncan, who adds that the Butler was where visiting celebrities would stay. It was home to movie and theater people, generals and presidents. And to the best orchestras; Zez Confrey, Charles Dornberger and Herb Wiedoeft played there. Vic Meyers. He stayed quite a bit longer in the Butler than his two-year contract said. And when Brunswick showed up in Seattle, Meyers band had sufficient quality and local fame to be selected for recording. The first records made by a band or singer for a large company usually were a test for both parties. The band had never been in a studio and the engineers did not know the band. The ODJB illustrated this once and for all at Columbia in 1917. Vic Meyers first recording was no exception. Both numbers are 'hot' Tin Pan Alley tunes, ideal for jazz arrangements. Listen to the Benson Orchestra's version of Mean Mean Mama with sideman Frank Trumbauer or to Lanins Southern Serenaders numerous versions of Shake It and Break It (originally written as a xylophone solo by Lou 'Frisco' Chiha.) Meyers band can stand the test of comparison but there are no great surprises in their performances. The band is holding back and therefore its a pity that these are the only Meyers titles reissued so far (Timeless CBC 1-034, listen to the excellent recording of the cymbals!). Solos on cornet, trombone (in stop time) and sax, but all of it somewhat careful and contrived. Copies of Vic Meyers first Brunswick in the collection of Mark Berresford and of myself have Meyers autograph on the label. It must have been a good day for Vic, signing one copy after another, proud if his first recordings! The 1925 Brunswick catalogue lists all 4 new Brunswicks and calls Vic Meyers an Exclusive Brunswick Artist, from the Pacific Coast. The Hotel Butler is no longer mentioned. The band is even called the latest of the Brunswick "popular dance organisations". The two titles from 1923 are not mentioned anymore. This can only mean that the reaction of the record-buying public was not so favourable. Abe Lymans 1923 recordings are all still fully listed, and for Herb Wiedoeft there are even words of praise about for his first recordings. Things are a little different for jazz collectors; Meyers Brunswicks have a high jazz content and indeed belong to the best from the West Coast. Moreover they are usually hot on both sides (or else both are boring!). The three titles of 7 May, give Vic Meyers band a place of honour in the history books of white jazz. They are two old pieces from the final ragtime period, plus a composition by three members of the band. From its first notes, Weary Blues, published in 1915 by the black ragtime composer Artie Matthews, we hear a first rate band. The first note is from a C-melody sax, that I do not hear on the 1923 titles. It may also be an alto sax, its quite like Frank Trumbauer anyway, who although still relatively unknown at the time, was making a name among musicians for his work with the Benson Orchestra and his chorus on the Mound City Blue Blowers San. The cornet player is also a lot more aggressive than on their first recordings and his muted work is of a high quality. I really would like to know who these gentlemen are. The names of cornet player Bill Zimmerman and reed player Bob Gordon show up as composers of some of Meyers best recordings. So lets baptise them this way until we know better. These recordings give me the impression that both are newcomers in the band, and that they had a strong hand in the new arrangements. Tell Me What To Do is a composition by three members of the band. Beets And Turnips is from earlier vintage again. It was recorded in 1915 by several ragtime aggregations, but found a new lease of life in 1924, with a version by the Varsity Eight on Cameo as well as Meyers'. On the ensuing sessions, some pieces were recorded with less freedom for the soloists. Spring-Time Rag is another ragtime-composition, this one dating from 1916. This preference for ragtime reminds one of another West Coast band that came much later, the Lu Watters band. The introduction of Springtime Rag was taken by its composer Paul Pratt from Mendelssohns Fruehlingslied (Spring Song). Vic Meyers Twenties-arrangement features a piano solo. The next titles, Burmalone and Heartbroken are less interesting. However the band gets back to business in the second week of these recordings, with the tunes Mean Looks and Helen Gone. The arrangement of Mean Looks features a trombone-clarinet duet, followed by solos from the two. Mean Looks starts with a trombone/clarinet duet followed by solos of the cornet and sax stars and ends with a magnificent final ensemble - unforgettable. Helen Gone is a full feature for cornet player Bill Zimmerman, who takes two fine solos, the first of 32 bars, the second 16 bars. These recordings further increased their popularity, and so the band went on tour again and arrived in New York. Here they made a record for one of Brunswick's competitors, Cameo, without even the benefit of a pseudonym. Maybe their Brunswick contract wasnt so exclusive after all. The result, Africa, one side of Cameo 576, has no jazz value. For jazz, Brunswick was needed once again, but the choice of tunes and arrangements were a strange this time around. During their stay in New York they recorded eight titles for Brunswick at the end of November and the beginning of December 1924, of which six were released. As far as jazz is concerned these six range between top and flop. The top is Nay, Dearie Nay, composed by Bill Zimmerman and Meyers trombonist Bill Taft. First Zimmerman and tenor saxophonist Bob Gordon play two strong solos, 32 and 16 bars respectively. Thats not so bad, but the music climaxes really with Gordons break, played a little later in the arrangement - just four hot notes, the first a long, curved one, followed by three short ones. These are played with an expressiveness that only the such greats as Adrian Rollini and Jelly Roll Morton could lay into a few well-placed notes. In my view this also has to do with a musical sense of humour. This was the recording that long ago created my friend Leen Zijfferss enthusiasm, after he found it on the English Guardsman label under the pseudonym of Carnival Dance Band. Even Rusts 5th edition doesnt mention this issue, but it does mention several other minor English labels. In the USA Brunswick had by late 1924 acquired the Vocalion label and Bill Triggs has shown in VJMs pages that as a result both labels would allocate some of their recordings to the other. Thus Nay, Dearie Nay was issued on the higher-priced Vocalion 15056 and therefore is harder to find than Meyers other recordings from this period. Brunswick 2800 is not a bad record to have in your collection, since both sides feature banjo player Harry Reser. For Reser these recordings were just a studio gig like the many he did for Brunswick in New York; he never was a regular member of Vic Meyers band. The titles are Shimmy and Sad, the latter with a vocal by Frank Bessinger, the same Frank who, according to Victor officials, was needed to help sell some of Jean Goldkettes titles. After 1924 Vic Meyers made no further recordings for Brunswick. Paul Ash and Herb Wiedoeft cut back as well, possibly because of poorer sales than those realised by the bigger name bands of Ray Miller, Ben Bernie and Isham Jones. Ash quickly switched to Columbia whilst Wiedoeft made no records for two years. Meyers was not back in the studios until September 1927, when he commenced recording for Columbia. This was in Los Angeles, a few weeks before Curtis Mosbys band cut their first record. Meyers Columbias have been neglected by jazz collectors, which is why nothing is known about their personnel. However there are some surprises. Fifteen titles have been issued, of which I have heard 12. Again everything between top and flop. The first Columbia title was Now That Youre Gone, issued on Columbia 1168D. A Meyers composition, it opens with the trombone player only, who is joined by a kazoo. The music sounds like a black band for a moment and continues with a territory sound. One Billy Ulman is the vocalist. At this time Vic Meyers apparently was contracted again by the Butler hotel, judging by the labels of the first Columbias. In June 1928 Meyers made further recordings for Columbia when their mobile recording unit visited Seattle. I have heard most of these and most of it is well-played straight dance music. A promising title like Elmer Schoebels tune Nobodys Sweetheart starts off with a straight trumpet solo, has a nice rhythm and features a trombone duet, but nothing sensational happens. Its reverse, Ada, written by Meyers about an employee at the Butler, is a take-off on the hit Dinah and has no jazz value whatever, like the other 1927/1928 titles Ive heard. However, theres better news about Meyers final recordings, made in New York in 1929. Columbia 2026D, Congratulations and Melancholy, offers a new Meyers band, which again emphasises arrangements instead of solo performances. But listen to these tunes. Firstly there is the powerful playing by the bass ist, who really makes the band swing. He plucks, slaps and bows, like no one I heard except some bass players from New Orleans such as Steve Brown and Chink Martin. There is a solo on alto sax by someone who also might come directly from New Orleans. Rose Room on Columbia 2120D with a flip side by Ben Selvin, is even better. This Art Hickman composition was 10 years old by that time, but I believe its title also relates to Meyers spot by the same name in the Butler Hotel. Rose Room was brilliantly arranged for Meyers band; it holds ones attention from the opening bars. Several experienced persons have listened to these sides now and reactions consistently compare them to the Jean Goldkette band, in particular because of the rhythm. Only a few weeks before his recent death, Goldkette alumnus Spiegle Willcox, listening to Col 2026D, said he thought the bass player to be Steve Brown. Out of music and into politics. 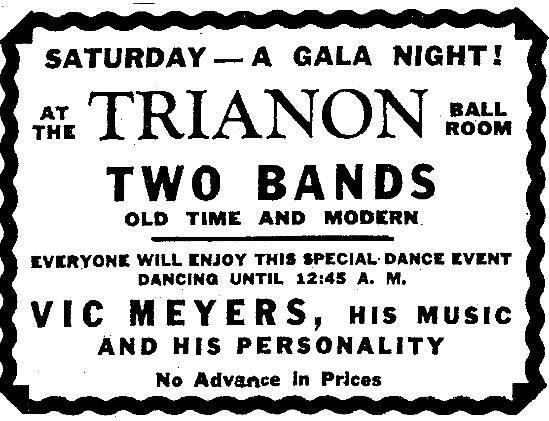 By early 1932 Vic Meyers was back in Seattle, playing at the Trianon, a ballroom that had opened in 1927. He also operated Seattles most celebrated night club, the Club Victor. He was by now a local celebrity and his pencil thin moustache was something of a trade mark. This was the time of the Depression when Democrat Franklin Delano Roosevelt won the 1932 election by a landslide. In Seattle, Doug Welch, assistant city editor of The Times and a practicing humourist, regarded the race for office as too dull. He was thinking how to get a headline in his newspaper and got a brain wave to call popular band leader Vic Meyers and promise him an eight-column head line on page one if Vic would run for mayor. Meyer agreed and created his own publicity campaign. "Tell me, Mr. Meyers, how do you stand on the garbage-collection issue" "To the windward, madam, to the windward"
"Theres not going to be any cheap chiselling on city contracts while Im mayor. Im going to take it all myself". "Instead of daylight saving time, Seattle ought to have two-four time, allegro"
Female beauty also helped. He promised beautiful hostesses on each street car and dazzling Hollywood actress Laura La Plante was drafted in as his campaign hostess. Meyers had photographs in the papers of him kissing her. Despite all the ballyhoo, he lost the run for mayor. However, Meyers was bitten by the politics bug. He decided to have another try and later that year he went out to file for the position of democratic candidate for governor of the state of Washington. At that time prospective candidates had to deposit a downpayment of 1% of the annual salary of the position filed for. In this case $ 60 for the governors $ 6000 pay. Alas, Vic didnt have that much money with him and asked the clerk what he had for $20. Running down the list it was found that Meyers could run for lieutenant governor for $12. He easily won the nomination and actually got into office when Roosevelt became president. The night of his election, rather than basing himself in his campaign office, he was with his band at the Trianon. For the next twenty years, four more elections, he kept this position until Eisenhower and the Republicans got into office in 1952. 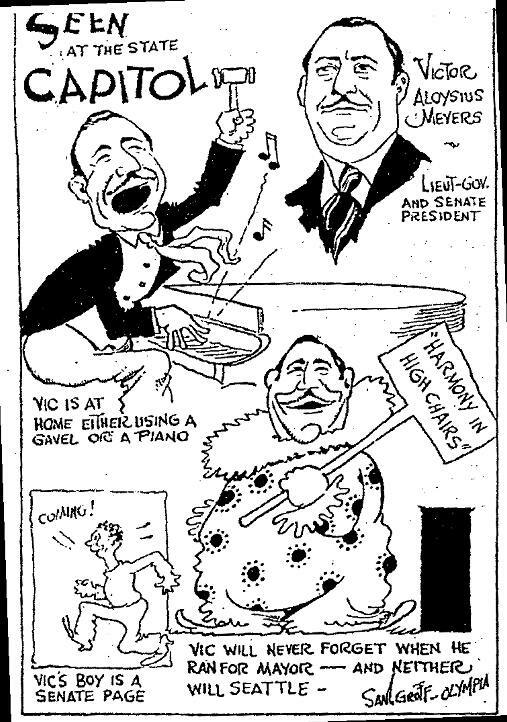 Twice during these years Vic tried to run again for mayor of Seattle but lost, both in 1938 and in 1946. His fine political career couldnt have happened if Vic had not also developed a serious interest in public affairs. He studied parliamentary law and presided over the Senate with skill. "The trick was to be fair and impartial or give the impression", Meyers later said in an interview. He was a man of many surprises and ideas. For example, just after World War 2 he got the idea of creating a large park in the east of the state of Washington at an astronomical price and was ridiculed for it. Sun Lakes Park now stands as one of the best and busiest in the state. There are numerous stories about Meyers in the political period of his life, told many times and in many variations. One well-known (and probably apocryphal) has him driving a car with loudspeakers in the middle of the night and promoting his political opponent. Another has his opponent doing this to him after Meyers had a friend, a Shakespearean actor, stand in for his opponent at a womans club. There he made a luncheon speech advocating prostitution and open gambling. His salary as lieutenant governor was a lot lower than what the governor earned or what Vic earned as a bandleader. He got around $100 a month, the governor had $500 and his 14-piece band made $1000 a night, but he compensated that with a high expense account. This he had sometimes to defend, like the time he made a trip in a state-owned Cadillac to the East Coast. His reaction was "Why pick on Vic?" and this slogan worked for another successful campaign. His efforts to improve his income by attracting more work to his office or trying to get himself legislated as an attorney did not work. He stayed out of office for only four years, 1952-1956. In this period he had the first of three cancer operations, but in 1956 he was back in office, now as Secretary of State. He would say: "The last time I talked to you people, I asked to help old Vic out, now Im asking to help old Vic back in." He held the function of Secretary of State till 1964, when he was 66 years old. His defeat came when someone stole state anti-gambling petitions with 82000 signatures from his office before they were validated. The voters left him. However there still was a lot of life left in him and in 1976 Vic Meyers filed again for secretary of state, but reluctantly had to give up, mainly because his condition did not allow him to stand the strain of campaigning, which was aggravated by a recurring case of arthritis. Gone were the old days when he would say of an opponent "I wont tell any lies about my opponent, if he wont tell the truth about me". By this time Meyers had acquired the nickname "the Clown Prince of Politics". He now owned a golf course and a small apartment house, Colony Park in Kent, where he lived with his daughter Mary Louise Moore. Now and then a local newspaper would have an article about him or an interview, but he had really left the limelight. Except for one occasion in 1990, when he was living in the Mount St. Vincent Nursing home in West Seattle. Some jazz collectors in collaboration with the Meyers family and the staff of the nursing home organised a celebration for him. Posters were hung and his music filled the room. His four grandchildren were there, Judith, Jim and Vic Meyers III and Patty Eckloff as well as his great-grandchildren Aimee and Ryna Meyers. Ted Harris, former manager of the Trianon, also came. Merle Smith presented her book "Seattle Had A Tin Pan Alley Too" with details of Vics career. At the time of the celebration, Vic Meyers was 92 years old and he had to use a wheel chair. He passed away a few months after this event. Today two floors remain of the old Butler Hotel, serving as a parking garage. Fortunately we have Vic Meyers music, and theres more of it than has been supposed for a long time. The Timeless label will shortly be issuing a CD with the hot music of both Vick Myers and Vic Meyers. A great finale to a long period of finding facts and recordings and an opportunity for the worlds collecting fraternity to share their pleasure in listening to these fine Twenties bands. We are indebted to Rick Jorgensen of The American Gramophone and Wireless Co. of Orting, Washington for most of the information about Meyers life. Rick and some friends organised the celebration for Meyers in 1990. Others who helped me were John R.T. Davies, Hans Eekhoff, the late Len Kunstadt, Ross Laird, Doug McClellan, Bill Triggs and Leen Zijffers. Thank you all.